You may be whipping up Easter recipes handed down from your grandmother, but that doesn't mean your deviled eggs have to be boring when you give them a multi-hued twist. Learn how to create colored deviled eggs using a simple update to your favorite Easter appetizer recipe. First, hard boil your eggs and let them cool completely in the fridge or a pot of iced water. The longer you leave those puppies to cool, the easier they will be to peel. 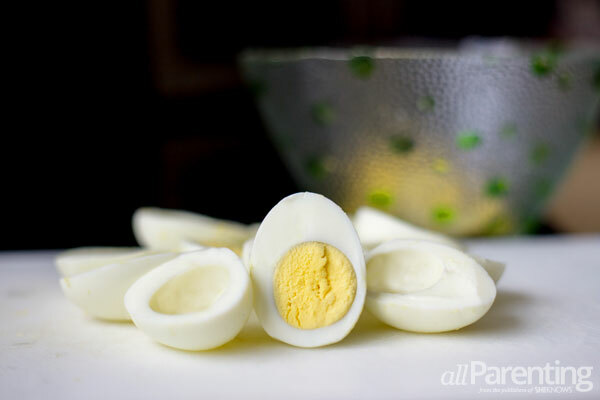 Next, peel your hard-boiled eggs and slice them in half lengthwise, setting the yolks aside in a bowl for later. Then, for each hue of colored deviled eggs you desire, mix 3/4 cup water, 2 teaspoons vinegar and 3 to 6 drops of food coloring. Repeat for each color in separate cups. 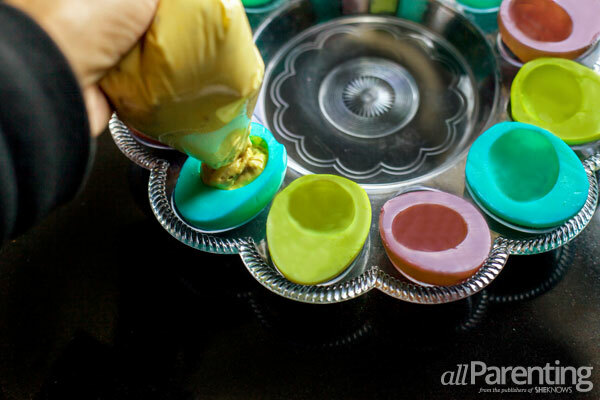 Now, submerge 2 to 3 hard-boiled egg whites at a time in each color for 2 to 4 minutes. The longer you leave the deviled egg whites in the color bath the deeper the color will be, but it doesn't take long so keep your peepers on those Easter appetizers. 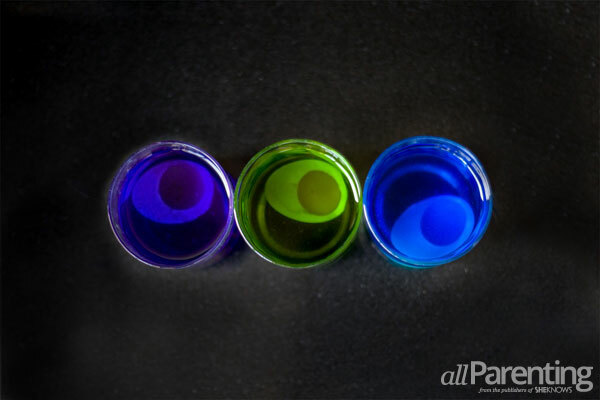 The color also continues to become more saturated even after the eggs are out of the dye so don't worry if the colors seem a little muted at first. 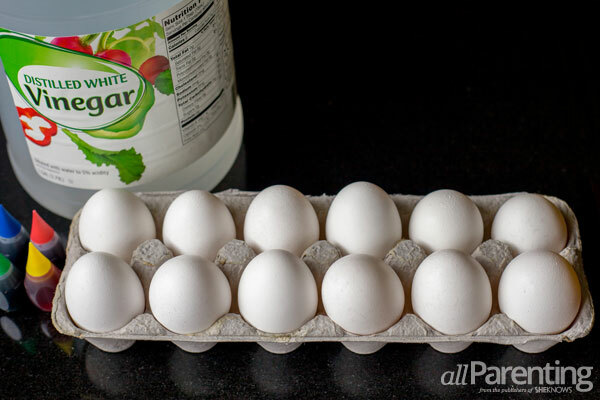 Next, remove the tinted egg whites from the colored water and allow them to dry face up on a paper towel, using separate towels for each color. 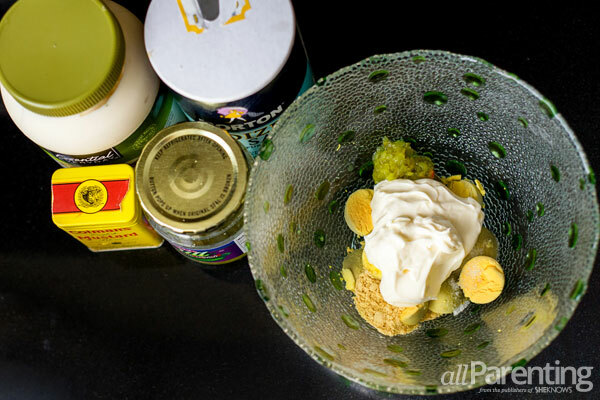 While giving the egg whites time to dry, take your bowl filled with egg yolks and blend in your mayonnaise, mustard powder, salt, Worcestershire sauce and relish until smooth, or use your favorite Easter deviled eggs recipe. Spoon into a zipper-close sandwich bag and snip a bottom corner of the bag. Finally, once your colored deviled egg whites are dry, use the snipped end of the zipper-close bag to pipe your egg yolk mixture into the center of each Easter appetizer. 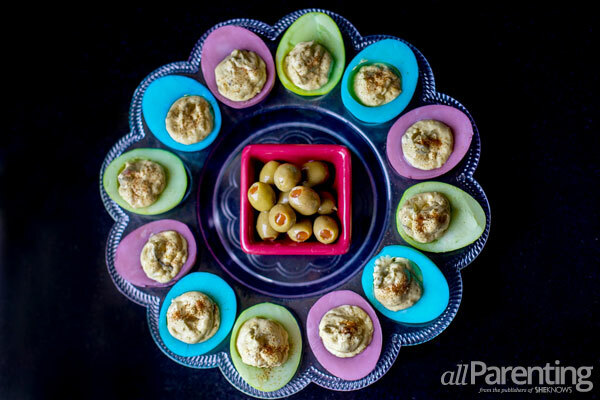 Sprinkle lightly with paprika if desired and serve your colored deviled eggs at your Easter soiree!